Inside the front cover is an image of Emu in the skies; Pascoe calls this Biame, the creator Spirit Emu, who left the earth after its creation to reside as a dark shape in the Milky Way. The emu is inextricably linked with the wide grasslands of Australia, the landscape managed by Aboriginals. The fate of the emu, people and grain are locked in step because, for Aboriginal people, the economy and the spirit are inseparable. 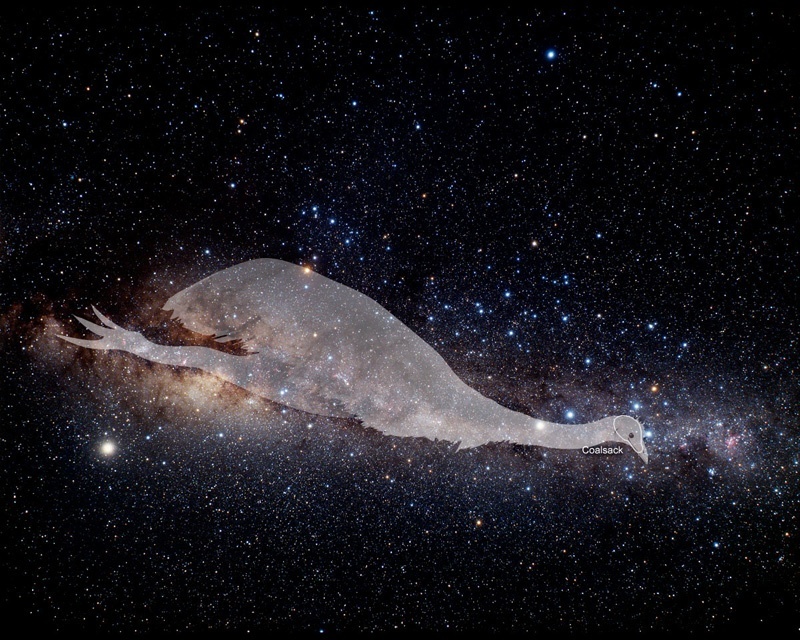 Europeans stare at the stars but Aboriginal people see the spaces between where the Spirit Emu resides. This is a somewhat sobering reflection, for both the title and cover of this book start and end with Emu, suggesting that all life and how one ekes a subsistence from the land is in fact a spiritual activity taking place in a spiritual landscape upon which I-we-you are but temporary visitors. So whatever historical material presented in this book should be considered in the light of this spiritual foundation, including the antics of and the mistaken interpretations and misled observations of the original explorers and settlers who provide the history in this book. It is often said that history is written by the victors, the invaders. This book turns that history around to expose a deeper, transcendental truth: the land owned the indigenous Australians and they husbanded it in accord with their Dreamtime stories. 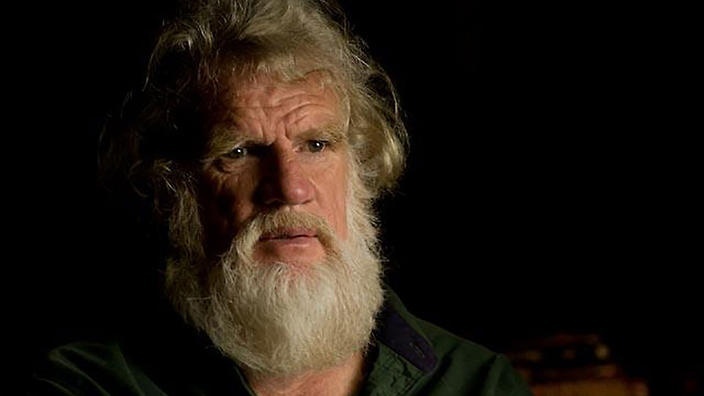 Pascoe harnesses the narratives of colonial observers of husbandry by Indigenous people such as seed selection, soil preparation, crop harvesting, eel and fish harvesting (the Brewarrina nets and dams are impressive), storage of surplus crops, and the establishment of large, settled populations in semi-permanent dwellings. We read of huts described by Mitchell, cultivation of yams, along with turning the soil over which increased yam production and growth. Early settlers complained the soil was originally soft and spongy. The introduction of cloven hooved stock cropped the growth and forced the soil to harden and water to run off and cause floods. It was originally supporting wheat, lilac and lillies. The idea of agriculture was so well advanced that seed was traded as a cultural item. Several explorers and commentators witnessed grain in small sealed packets being traded with distant relatives. This selection and trade of seed over wide areas gradually changed Aboriginal food sources and produced qualities which agriculturalists recognise as domestication. The people would get in a line using their digging scoops and larger coolamons. The clay and earth was scooped into larger coolamons, which were passed along the line. The observer (Walter) commented on the speed of the operation; with a line of people working the deepening of the favoured catchment area and the building of the bank could be done at the same time. When it was satisfactorily excavated, the people would trample the clay base. If ant nest material was nearby this was carried and trampled in to give a very firm base. The Rural Industries and Development Corporation have defined the advantages of Australian native crops: they have been developed through seed selection, direct planting and weeding for the harsh Australian conditions. Many of the grains grow on sand and require a minimum of irrigation. The nutritional value of the seeds from the desert species has been found to be equal to or better than that of cultivated grains. In the region of the Darling River, Mitchell saw a small town where each hut could accommodate up to 15 people, being substantial constructions with thatches over 30 centimetres thick. “These permanent huts seemed also to indicate a race of more peaceable and settled habits”, Mitchell concluded. Mitchell became a great admirer of the Aboriginal house and wrote: “I began to learn thatg such huts, with a good fire before them, made very comfortable quarters”. Mitchell was sensitive to the quality of the houses but insensitive to his occupation of someone else’s residence. He occupied empty houses on many occasions and liberties of this kind were likely to have ruptured the relationship between white and black more severely than any other action other than physical attack. There is a sense in which prejudices and conceits prevail, along with the European romance of a sparse interior which would not support life. This book details the cultivation and storage of seeds of all kinds across a wide expanse of the interior (p. 29) along with construction and maintenance of dams and wells. Waterways were set up with fish traps and netting; photographs exist of catches of fish that are now extinct with swathes of netting in the background. We read of hutments, villages, and use of stone, leaf and threshes used in construction. The expeditionary explorer Sturt was saved from dying of thirst by Aboriginals more than once, yet the conceits, prejudices and misleading images of the aboriginal standing on one foot with spear and boomerang in hand waiting for the next errant kangaroo exist. There is impressive use of historical records to underlay all of Pascoe’s assertions about the economic livelihood of Aboriginals at the time of British Settlement. Primary sources are supplied with evidence that Aboriginals did till the land, alter the course of rivers, did construct a system of pan-continental government that generated peace and prosperity. Pascoe has shown that we need to stop, pause and think again about the notion of ‘hunter-gatherers’ and Aboriginals. These are the impressions of the settlers, that have been passed down. History is, as we told earlier, written from the view of the settlers. Through primary and secondary resources, Pascoe opens up a window on a thriving, self-sufficient and self-governed peoples who cared for the land and its meaning in ways unknown to the European settlers who brought their cows and killed thousands of Aboriginals with their cow pox. 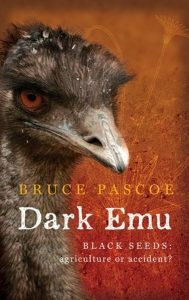 This is a book that needs to be set as reading for Year 9 – Year 10 in secondary schools in Australia; not optional reading, but mandatory, for understanding the true nature of the Aboriginal peoples’ economic and socio-political livelihoods; they were already a nation that belonged to the Dreamtime of Dark Emu, Emu Spirit, the Creator Spirit Biame.